Most people have only a general idea of the intricacies of public domain law. The rules of intellectual property have always been riddled with exceptions and updates, and finding pieces that are available for use can be tricky. The following musical works are all available in the public domain in one form or another. Songs available in the public domain come from a broad range of genres and styles. While the lyric sheets are all public domain, check the copyright information for each specific title or download for further information on performance files and how they can be used. Midi - PDF Hart A. Wand Written in 1908, updated in 1912 and 1918. Lyrics by Lloyd Garrett. Midi - PDF Eddie Green Written in 1917. Music and lyrics by Eddie Green. 3. All the Pretty Little Horses Anonymous American folk song by unknown author. 4. Anthem for Easter William Billings Hymn written in 1787, words by Edward Young (Luke; I Corinthians). 5. Early in De Mornin' William Shakespeare Hays Written in 1877. Midi - PDF Stephen Collins Foster Written in 1848. Circumspection Brian Boyko Available as MP3, no copyright restrictions. 8. Für Elise Ludwig van Beethoven Composed in 1810. Recordings cannot be used for commercial purposes. 9. MC Ballad F Chuffy Frank Nora Source: Midnight Cassette System. No copyright restrictions. 10. Konzertstuck Ferdinand Hiller Classical music in three movements, published in 1871. PDF sheet music arrangements available. Midi - PDF Scott Joplin Written in 1899. Only sheet music is public domain. 12. Printemps Claude Debussy Classical song composed in 1887, published in 1904. Sheet music is public domain. 13. And Now For That Massive Coronary Peter Gresser MP3 download offered to public domain, copyright claims waived. 14. Home on the Range Daniel F. Kelly Lyrics by Dr. Brewster M. Higley. Written in 1873. Midi - PDF Jack Norworth and Albert Von Tilzer Sheet music and lyrics are public domain. 16. Il Barbiere di Siviglia Gioacchino Rossini The Barber of Seville, composed in 1816. Extensive sheet music downloads available. 17. The Four Seasons Anton Andre Jr. PDF sheet music downloads. First publication in 1851. 18. The Yankee Doodle Boy George Michael Cohan From the play Little Johnnie Jones. Originally published in 1904. Midi - PDF John Stafford Smith Published in 1814. Words by Frances Scott Key. 20. Semiramide Gioacchino Rossini Arranged in two acts. First published in 1823 in Vienna. Available as sheet music download. 21. Ride of the Valkyries Richard Wagner Composed in 1856-1870, sheet music is in the public domain. 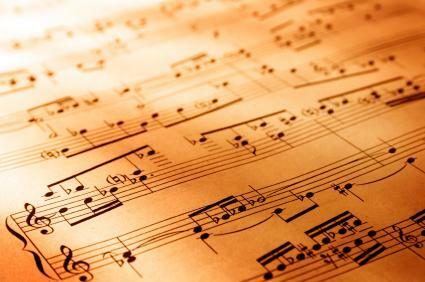 Music is a confusing area of public domain law because it makes an important distinction between the content of a musical work (the musical score) and the sound recording of that work. The laws that govern this intellectual property in the United States fall into three general categories. When considering lyrics, the written score of music, or a combination of the two, the law governing when a copyright may expire and the work enters public domain falls under three general categories. These categories are based on the year that the work was originally published. Published before 1923: The maximum copyright length is 75 years, meaning all works that were published before 1923 entered the public domain no later than 1998. This may include a number of traditional, classical, or folk songs. Published between 1923 and 1978: Based on the Sonny Bono Copyright Term Extension Act that was signed into law in October 1998, works that were published between 1923 and 1978 were offered an extended maximum copyright protection period of 95 years. The first works from 1923 that will enter the public domain will do so in the year 2019. Published after 1978: The 95 year copyright period has changed for works published after 1978. The base date is not always the date that the work was published, but rather the time of death for the longest surviving author of the work. When that individual passes away, the copyright will extend for an additional 70 years. For example, if a work was published in 1990 and the last surviving author passed away in 2000, then the work will enter public domain in the year 2070. Based on this, the first work published after 1978 could become eligible for the public domain starting in 2049. The legalities are quite different surrounding the copyright on an actual sound recording or performance by an individual or group. For instance, while a particular song itself may be a part of the public domain, the recording of that song as performed by a specific person may not be in the public domain. Published or fixed before February 15, 1972: The work is subject to common law protection and/or state statutory protection. These works will fully enter the public domain starting on February 15, 2067. Published between February 15, 1972 and 1978: When published without notice (no year of publication or name of copyright owner), the work is in the public domain. If the work was published with notice, the copyright expires 95 years from the date of publication, so the first works here to enter the public domain will do so in 2068. Published between 1978 and March 1, 1989: When published without notice, the work is considered to be a part of the public domain. If the work was published with notice, then it will enter the public domain 70 years after the death of the last surviving author. If the authorship is corporate, then this extends to the shorter of 95 years from publication or 120 years from original creation. The first of these works will enter the public domain in 2049. Published after March 1, 1989: All works published after this date are subject to the same rules as those published with notice in the previous 1978 - 1989 period. The 70/95/120 rule above prevails with the first works to enter public domain in 2049. Creative Commons copyright licenses have been created in such a way that musicians and other content creators can grant permission for other people to use their work in a standardized and formalized manner. There are six main variations and combinations of Creative Commons licenses that a copyright owner can attribute to his or her work. CC BY: Others may distribute, remix, alter and build upon the work as long as credit is given to the original copyright owner. This license allows for commercial use of the work. CC BY-ND: In addition to the credit given to the copyright owner, this license does not allow for any derivative works. This means that the original work must be unchanged and provided in its entirety. CC BY-NC-SA: This license requires appropriate credit to the copyright owner and allows for the modification of the original work, as long as the resulting works are licensed under the same Creative Commons terms. The "NC" in the license indicates that only non-commercial usage is permitted. CC BY-SA: This license is identical to CC BY-NC-SA, except that commercial usage is also permitted. CC BY-NC: This license requires appropriate attribution and allows for modifications, as long as the the resulting work is non-commercial. CC BY-NC-ND: The most restrictive of the licenses, this one requires attribution to the original copyright owner when the work is shared, but the sharing can only be used for non-commercial purposes and no derivative works are allowed. An additional Creative Commons license is called CC0 1.0 Universal (CC0 1.0). Under this license, the person who originated the work has waived all of his or her rights and dedicated the work to the public domain worldwide. This means that the work can be copied, modified, adapted, and distributed without permission, including commercial uses. Copyright law can be incredibly complex and this is particularly true when dealing with musical works and rights from different countries. While some works may be considered a part of the public domain in one country, local laws in another country may not agree. Given the global context of the Internet, it is generally prudent to err on the side of caution. If you are not sure whether a particular work or performance is a part of the public domain and can be utilized to suit your purposes, then it is best to seek the guidance of a copyright lawyer.